A two-page PDF containing Spanish vocabulary to refer to African textured hair, compiled by Ariana Brown, with contributions from Afrolatinx Twitter users. 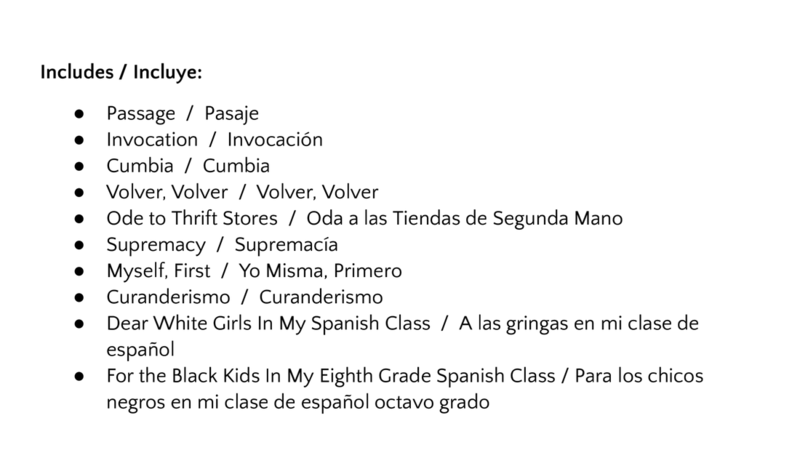 This list was compiled in the hopes of making Blackness more visible in the Spanish language, giving Latinxs of African descent a more complete vocabulary to discuss Blackness and its features. Contains discussion questions and a linguistics activity. Excellent for anti-racist, bilingual workshops and classrooms. Compiled & Creative Commons licensed in Nov-Dec 2017. Free for download and use. Includes ten (10) of Ariana's most popular poems, in their original English versions, with accompanying translations in Mexican Spanish, and video links. Ariana performed the initial translations, followed by edits from Itzel Guadalupe Garcia, a Spanish-dominant Mexican poet & friend. Poems arranged in a downloadable PDF emailed to the purchaser upon receipt of $1.00 USD payment. Incluye diez (10) de los poemas más populares de Ariana, en sus versiones originales en inglés, con traducciones en español mexicano, y enlaces de video. Ariana completó las traducciones iniciales. Itzel Guadalupe García, una poeta mexicana y amiga de Ariana, terminó las revisiones. Los poemas están colocados en un PDF download envió por email. Cuesta un dólar $1.00 USD. Video link is provided in lesson plan. Bilingual copies of "Passage" can be purchased above for $1.00 USD as part of "Ariana's Most Popular Poems, in English and Spanish." LP designed by Ariana in collaboration with educators Jesús Valles and Saba Khan Vlach. Video link is provided in lesson plan. Bilingual copies of "Invocation" can be purchased above for $1.00 USD as part of "Ariana's Most Popular Poems, in English and Spanish." Consider also utilizing the "Black Hair Vocab in Spanish" bilingual chart above. LP designed by Ariana in collaboration with educators Jesús Valles, Saba Khan Vlach, and Gabriel Cortez. Video link is included in lesson plan. Bilingual copies of "Curanderismo" can be purchased above for $1.00 USD as part of "Ariana's Most Popular Poems, in English and Spanish." LP designed by Ariana in collaboration with educators Jesús Valles and Saba Khan Vlach.